eighth night, originally uploaded by jahansell. 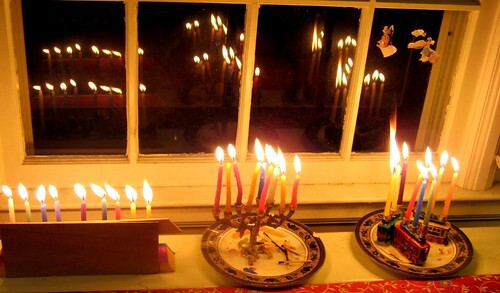 Last night we lit all eight candles - the first menorah on the left is made of wood (whose idea was that?) and belongs to my older daughter. The one in the middle is a tree and was a gift from my husband to me. The one on the right is a train, a gift from my parents to my youngest daughter. By the end of the 8 days, they still hadn't quite gotten the hang of sticking the soft, easily breakable candles into the holders (first you have to scrape out yesterday's wax bits) lighting the match, and igniting each candle so you don't drip wax on your fingers - each candle seems to go out at least once so the prayers are long done by the time the menorah is completely lit. We may not have a menorah on the town green (and I appreciate the interesting comments that were left when I posted about that a few days ago) but anyone passing by could see our candles burning bright. I didn't know what menorah was Jenny. Thanks for bringing some light into my knowledge!